Scores of companies hold permits to test autonomous cars in California, yet even leaders like Waymo, once Google’s self-driving project, are unwilling to commit to when such vehicles might be appearing in showrooms. The relentlessly hyped arrival of autonomous vehicles looms as the greatest disruption in personal transportation since Henry Ford’s moving assembly line started producing Model T’s by the millions. One word in that statement — arrival — is, however, doing a disproportionate amount of work. Self-driving vehicles, despite being the subject of breathless media reports and in automakers’ strategies, remain years from being available to private owners. Scores of companies hold permits to test autonomous cars in California, yet even leaders like Waymo, once Google’s self-driving project, are unwilling to commit to when such vehicles might be appearing in showrooms. Even with so many companies testing self-driving cars — 10 million miles since 2009 by Waymo alone — the definition of autonomous continues to be murky, at least to the public. What is available today in driver-assistance systems like Cadillac’s Super Cruise or Tesla’s Enhanced Autopilot may offer hands-free motoring in some situations, but they are far short of what is known as Level 5 full automation under the standards of SAE International, a standards-setting organization. That capability entails operation on any road in any conditions that a human driver could handle; logically, cars built to this standard would have no need for a steering wheel or foot pedals. With this radical shift in driving comes questions about the viability of traditional business models based on the private ownership of cars and the dominance of the large carmakers. That upheaval creates opportunities, making way for new players, many that bring the digital mastery that a new generation of driverless cars will demand. It looks like a Silicon Valley replay, both philosophically and geographically. Startups sprout wherever the ground is fertilized with cash; already there are giants like Waymo, Lyft and the General Motors unit Cruise. All have outgrown the beginner phase. Still, Reilly Brennan, a general partner at Trucks Venture Capital and a lecturer in transportation at Stanford University, is cautious about how quickly a commercial market will develop for new companies. “Fully unstructured driving by go-anywhere cars is a long time away,” he said in a telephone interview. “Few startups actually understood the commitment required to create a complete vehicle.” Instead, Brennan suggests, autonomy will first come to specialized applications like agriculture, mining and fleets dedicated to city delivery routes. 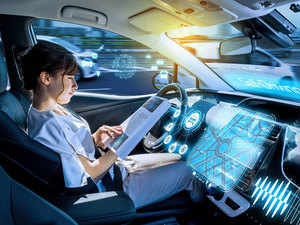 The vast amount of data that must be digested by an autonomous car gives rise to another class of participants: the suppliers of the underlying technology like analysis tools and sensor systems. Danny Shapiro, senior director of automotive at Nvidia, a partner with several prominent autonomous-vehicle developers, emphasizes the crucial role of such companies in making possible the cars that will be built without pedals or steering wheels. “Our approach was to build an artificial intelligence brain, a supercomputer the size of a laptop to interpret the data from a car’s sensors and build a 3D picture of its surroundings,” Shapiro said. While creeping along in a highway traffic jam may not be so demanding, detecting a distracted pedestrian on a city street and plotting a safe reaction is far more rigorous. “When it comes to dealing with those situations, there’s no such thing as having too much computing power in the car,” he said. Following are some of the startups that are expected to play a role in developing the diverse ecosystem of autonomous vehicles.